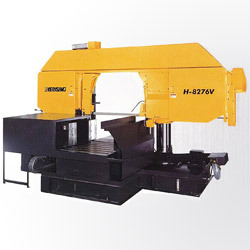 1.T type : hydraulic shuttle table feeding, V type : hydraulic vise feeding. 2.Hydraulically controlled dual-vise full stroke clamping system. 3.Roller bearing and hydraulically clamped carbide blade guide system. 4.Variable blade speed controlled by inverter. 5.Saw frame height selector gauge. 8.Powered movable guide arm with hydraulic lock. 9.PLC control for all electric and hydraulic functions. 10.Independent electric cabinet and control panel. 11.Idler wheel motion detector with blade stalling and breakage shut-off. 12.Automatic saw frame return selector. 13.Cutting fluid flushing hose for machine cleaning. 17.One set of bi-metal saw blade. 1.Dead roller table, 2 meter long. 2.Power roller table, 2 meter long.